While Russian diplomats and hundreds of tourists feel disappointed with the cancellation of the Indo-Russian festival in Goa last week, the state government believes there was no harm done to Indo-Russian relations and says it values Russian visitors. Today the organizing committee announced the losses from the cancellation amounted to more than $320 000. According to Ksenia Goryaeva, Head of Russian House in Delhi and one of the main organisers, the losses could be higher since many other companies were participating in the festival and many tourists flew down to Goa and booked hotels. “I have met several couples who had paid a huge amount of $4000 for the special “festival” package to Goa. They must be feeling very disappointed,” says Natalia, 27, from Perm who has been coming to Goa since last 4 years. The organizers are planning to initiate legal proceedings action against the Goa government. Meanwhile in his statements published in local print edition of the Times of India, Goa Chief Minister Manohar Parrikar said the cancellation of the Indo-Russian festival would not affect India-Russia-ties. “We have not targeted Russians in Goa to strain Indo-Russian relations, we have just not granted permission to a business event,” he said. In 2013, the famous Sunburn festival organized by Mumbai based Percept Ltd for last seven years was under a threat of cancellation too. It was then transferred from Candolim beach to Vagator. According to reliable sources that insisted on speaking off the record, Sunburn 2013 got the final permission just a couple of hours before the festival started. The sources said, Goa’s authorities were angry that allegations of bribery for securing venues became public. The festival organizers and participants, including both musicians and spectators, interviewed by RIR expressed disappointment and regret that politics affected people’s feelings and the cultural camaraderie that Russians and Indians have always shared. The festival, they say, could have become yet another catalyst for expanding cultural relations. Goa’s authorities admit that Russian tourists are important for the state and said safety concerns for Russian citizens led to the festival being cancelled. 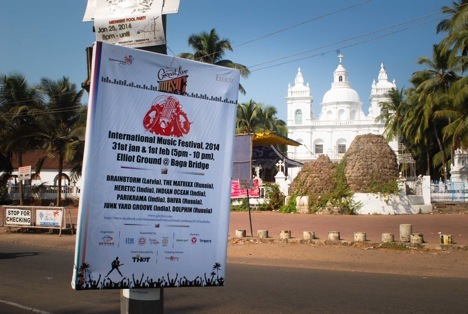 “It is a fact that there are issues between taxi operators and some of the Russian agents in North Goa and there were some incidents involving Russian tourist buses, so the government got worried that there should not be any adverse impact during the music festival, we didn’t want to further worsen the situation,” Nikhil Desai, Director Tourism and Managing Director Goa Tourism Development Corporation (GTDC) told RIR. He added that such events that are organized by private players should not affect long-term relations between Goa and Russia. “The government will work out a mechanism to see that such incidents like taxi drivers’ protests are prevented in the future,” he said. Calangute MLA Michael Lobo who opposed the Indo-Russian festival last week told RIR that he was not informed about the festival either by the organizers or by the Tourism Department. He claimed that a local church feast was scheduled not far from the festival venue and the loud music would disturb people who were coming there for evening prayers. On the situation with the taxi drivers’ protests, Lobo said the whole problem is created just by a few Russians who are working in Goa illegally, on tourist visas. “They are trying to eat into locals’ business by starting tour operating companies. And there are some Russian girls who are coming on tourist visas and distribute flyers and pamphlets on the beach, in supermarkets. So because of some 40-50 Russians the name of Russian nationals is getting spoiled. Calangute police station has about eight names of those Russians, five of them are already deported” Lobo said. He added that the Goa government has no problem with companies working in Goa legally, though he could not answer the question whether he knows of any illegal companies formed by Russians or with Russian management. Lobo also admitted that taxi drivers cheat foreigners and make them pay higher prices. “We are trying to establish taxi fares on an area basis. The fares book should be present in each cab, as well as the cab driver name and license and badge, so that people know who is driving them around. I’m trying to work out such solution with the government,” he said adding that taxi drivers will be ready to accept new policies. “The government should take action and bring rules and regulations in place. And whoever is going beyond those rules should be punished, whether he is Russian or Goan,” Lobo added. Nikhil Desai confirmed that taxi drivers, tour operators and agents who are dealing with Russian tourists will be invited for a meeting with Chief Minister of Goa that is supposed to be held later this week. ”We will sit across the table and put things in place because such incident should not happen again,” Desai added.